Rest turns to sleep, sleep turns to dreams, and the FaireLands turn over into a new day. A day that made me realise something. Well, a lot of somethings, but we’ll get to those in a minute or twenty, as soon as I’ve collected my thoughts. Our universe, our metaverse, is full of a million wonders. And I, without humility (what Sidhe is possessed of humility?) can say that I am one of those wonders. But the magicians who make the FaireLands? The magicians behind the magicians who create this once-a-year spectacle of light and sound and literature? These are the wonder-makers. It’s because of those magicians, in so many ways, that I can be who I am: Gwyneth Evans become Gwyneth, Queen of Faerie, born in the mind of a different kind of magician and risen, kneaded, and risen again in the kitchen of story. Many of my wanderings during this year’s Great Faire have been informed by magicians behind magicians: in this case, the wonder makers and thought experimenters of the Fantasy Faire LitFest. Each day, a different Realm came up as a tour for writers, and word-weavers came along to look at the Realms and write something down about them. So I shall take on a different guise for you today. I am Gwyneth, but I am something different. And calls for mist to clothe her shining limbs. Or maybe some inhuman synonym. And when she finds the source, she stands, spellbound. To bless her with the waterfall’s pure hands. In this dark land, she spreads her golden wings and calls for mis to clothe her shining limbs. Blackmoor. Land of darkness. Land of gargoyles. Land of enough cemetery architecture to make the most eyelinered up goth in Gothtown, Gothy McGothface, tear up and buy every Sisters of Mercy album. On vinyl. Again. In fact, it would be easy to walk through Blackmoor and not see anything but the darkness. But did you look up? But did you look up? Up into the trees? Up into a night lit with stars beyond counting? Did you travel to the edge of the land and look back upon the glimmering stars? Did you travel to the edge of the land and look back upon the glimmering stars against the waterfalls? Did you balance between a meadow and a waterfall? Did you balance between a meadow and a waterfall, trying not to be distracted by the glimmering lights overhead? I looked back from where I’d come. I looked back from where I’d come. Such a long way. That may have been the point where I realised I had hieroglyphs painted on my golden (!) skin, a scarab around my neck, wings like a bird’s rather than a butterfly’s. And I thought of myself as a vessel carrying the past into the future. Carrying my story. Carrying all my stories. Carrying my friends and family, and being carried when I cannot carry myself. Sometimes it seems like the hardest thing to reach for is hope. And yet, like the golden-winged girl in that poem made by my personal magician, I think sometimes it is not so far away at all. What if, even in the darkest of lands, hope yet remains? What if the golden light of hope fills us, and our bodies, our souls, vessels that carry the past into the future, also carry hope? Every life is a box. And every bit of hope is a star in the darkness, the mist of the water goddess, green shoots from the earth, ideas from the air. It’s in every box. It’s in every life. Far away from Blackmoor, on a cliff above the beach at White Owl, there sits a harper made of stone. She plays hope. Her box, at the bottom, contained a little sliver of hope named Words, and Music. Other people have the same kind of sliver. Still others have slivers named Science. Other slivers are named differently, but everyone has at least one. Hope. Like music in the night, like stars in the darkness, like a cure for cancer. It lives in every body. And in everybody. 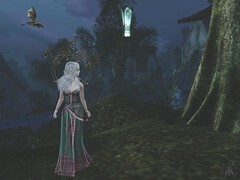 Yes, the Second Life Fantasy Faire officially closed last night! But the sims are still up and will be for a few days! If you haven’t been already, go check them out now! Thank you, everyone who works together to create and sustain the Second Life Relay for Life, and thank you, everyone who creates and sustains Fantasy Faire. The event itself is uplifting and inspiring, but nothing prepared me for the joyful and understanding and creative magicians I’d meet there. You are all stars in the darkness. This entry was posted in Fantasy Faire 2016 and tagged Analog Dog, Blackmoor, Bliensen & Maitai, Catwa, Fallen Gods, IKON, Maitreya, Musa, Poets Heart, Soul, The Skinnery, White Owl. Bookmark the permalink.